Daniel Ricciardo, defending champion of Christine's Rankings, is doing all he can to stamp his mark on this year's competition. It was the Red Bull team's home race this past weekend, and boy did both Daniel and Max get up to a lot of mischief. The Australian has rocketed to a solid lead in the table, but no lead is unassailable and it only takes one mis-step for everything to turn around. Also spotted in this bumper week of rankings: Valtteri Bottas getting in the spirit of things, Fernando Alonso indulging in a meme, and the worlds of tennis and motorsport colliding once again. +1 Valtteri Bottas: Channelling his inner Sound of Music. +1 Daniel Ricciardo: Risking retaliation from his teammate with this close up view of a vulnerable Max Verstappen. +1 Fernando Alonso: Alonso and Bottas doing their bit for road safety in Vienna. +1 Valtteri Bottas: Alonso and Bottas doing their bit for road safety in Vienna. +1 Daniel Ricciardo: Think they could have come up with better answers in this word association game but when they don't know what it is, they're cute. +1 Max Verstappen: Think they could have come up with better answers in this word association game but when they don't know what it is, they're cute. +1 Fernando Alonso: I'm pretty confident that it's not being a double world champion but this meme moment that Alonso wants to be remembered for. +2 Kevin Magnussen: Ready to sit back and enjoy the show in the pre-Austria press conference. +1 Lewis Hamilton: Spending time with kids from a London hospital as they got their own Cars 3 movie premiere. +1 Max Verstappen: Entering in the spirit of things with costume and musical instrument. 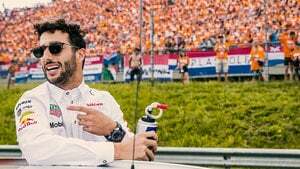 +8 Daniel Ricciardo: Really, truly, brilliant lap of the Red Bull Ring as narrated by Daniel Ricciardo doing impressions, chatting about kerbs, and saying "how the bloody hell are ya?" in the most Australian way ever. Properly good. +1 Valtteri Bottas: Taking part in the quick reactions challenge, as proposed following his epic start in Austria. +1 Max Verstappen: Indulging in a spot of ice hockey with his teammate before the Austrian race. +1 Daniel Ricciardo: Indulging in a spot of ice hockey with his teammate before the Austrian race. -2 Daniil Kvyat: I'm sure they were made to wear this outfit but oof, it's not a good look. -2 Carlos Sainz Jr: I'm sure they were made to wear this outfit but oof, it's not a good look. -2 Daniel Ricciardo: I'm sure they were made to wear this outfit but oof, it's not a good look. -2 Max Verstappen: I'm sure they were made to wear this outfit but oof, it's not a good look. +1 Max Verstappen: Great job with the crossbar challenge showing some nifty footwork. +1 Daniel Ricciardo: Great job with the crossbar challenge showing some nifty footwork. +2 Carlos Sainz Jr: Lovely gesture by Carlos Sainz to cross the streams of tennis and motorsport with Rafael Nadal. -1 Daniel Ricciardo: Pretty sure Dan should have learned by now that impressions aren't his strong point, bless!